In preparation for Texas Native Plant Week which happens this year from October 16-22, I’m going to profile some of my personal favorites. Since I have MANY personal favorites, it will be difficult to narrow the list. But, I’ll do ‘m best! 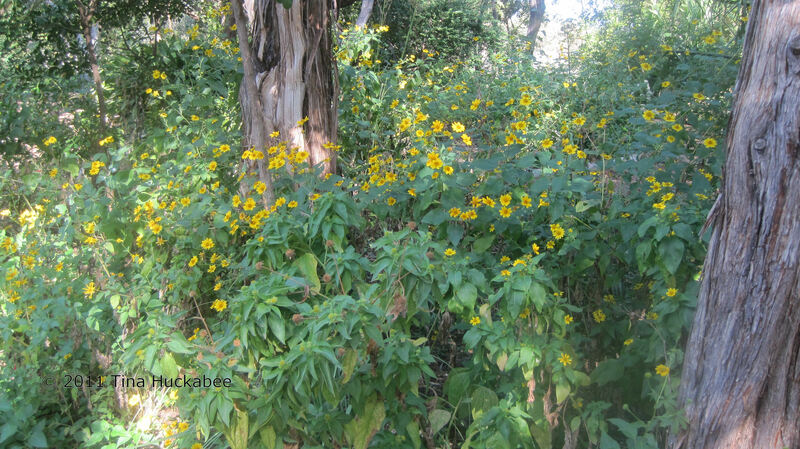 Blooming beautifully during October (even this October) is Goldeneye, (Viguiera dentata). 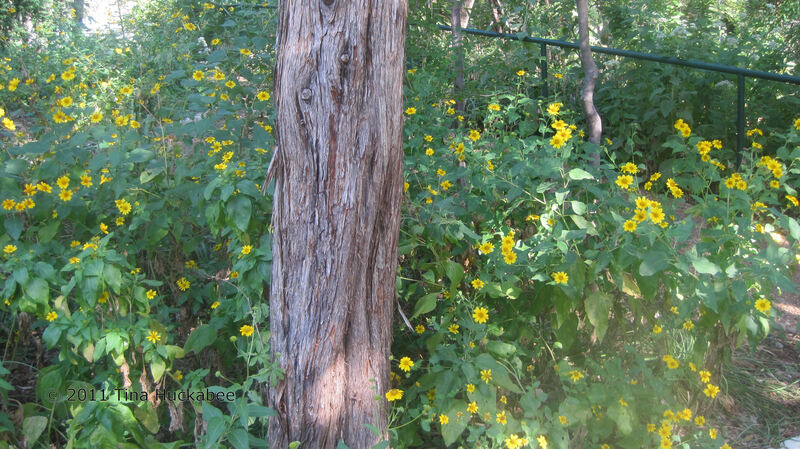 Goldeneye is a native Texas plant that is common in open fields or wooded areas as an understory. You’ve probably seen it blooming along the side of a highway–you can’t miss it. 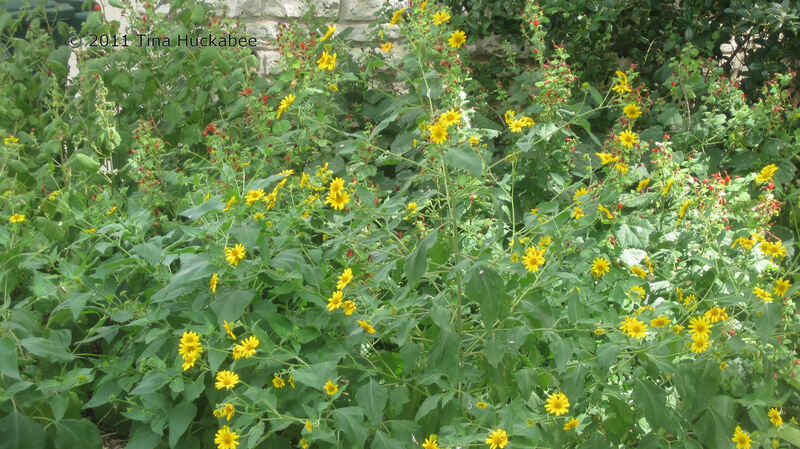 It has brilliant yellow flowers and during its peak bloom time, remarkably showy. Actually, it blooms sporadically, beginning in July, but the small flowers aren’t particularly noticeable until its massive bloom in the fall. 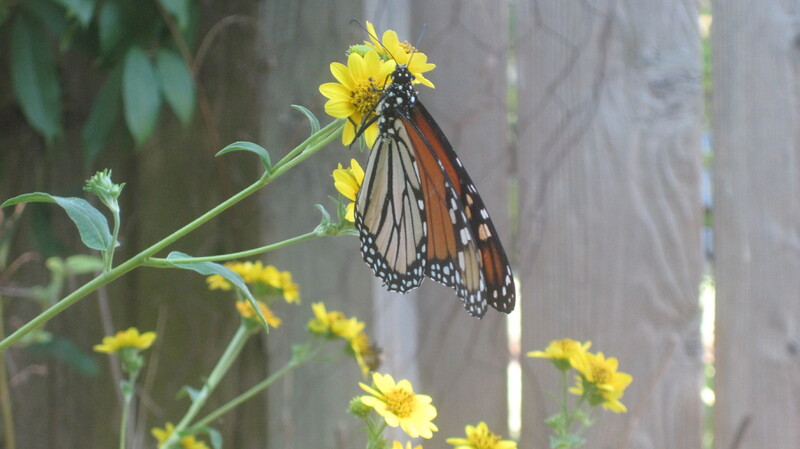 If the flowers look similar to native sunflowers, it’s because they are in the same family of plants, the Aster family. The leaves are probably also familiar–rather rough and similarly shaped. Most of the Goldeneye flowers are 1 to 1 1/2 inches wide. 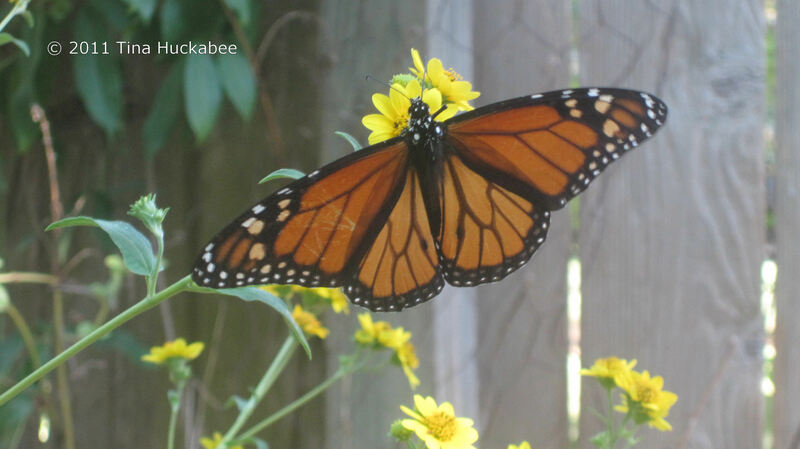 But like many native plants that are pollinated and naturally hybridized, there is some variability. One of my stands of Goldeneye has tiny (1/2 inch) blooms and blooms earlier than the others. Another stand has leaves that are about 1/3 larger than the other plants. 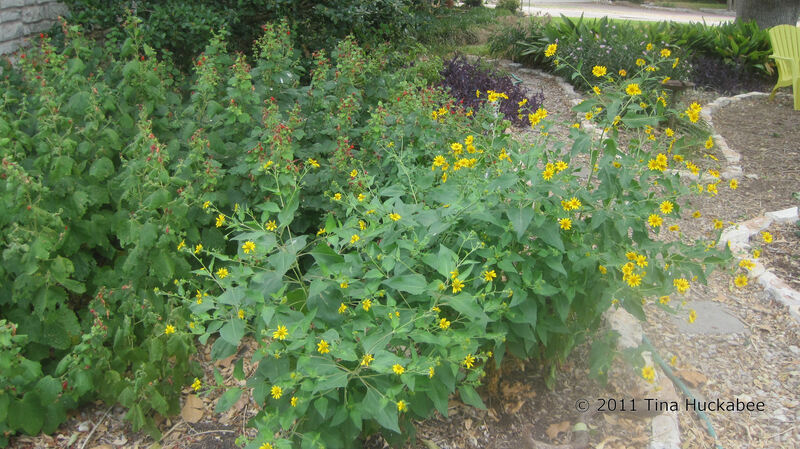 Goldeneye is easily grown from seed–just scatter it about either from a commercial seed source, (The Lady Bird Johnson Wildflower Center will host its Fall Plant Sale and Gardening Festival October 14-16 and is a good place to find this plant). Or maybe a nice friend will share seeds or seedlings. Goldeneye germinates easily and will readily self-sow. In full sun, it tends to stay a little on the short side (2-3 feet), while in part shade, it grows taller (3-5 feet). It’s usually multi-branched and can flop onto other plants. Sometimes, a branch will be so heavy as to completely break at the ground. It is a plant that might require staking. Goldeneye can be placed in the midst of a group of trees to brighten an area. 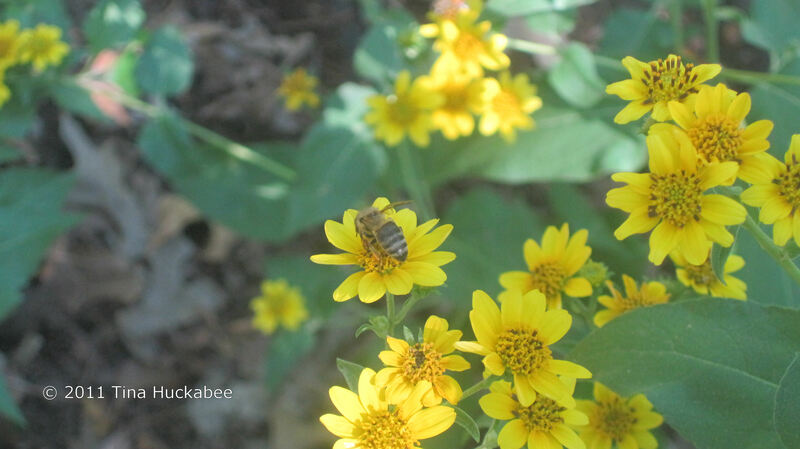 These photos are from a group in Shay’s Green Garden at Zilker Botanical Gardens. This trio of Goldeneye fronts a stand of Turk’s cap (Malvaviscus arboreus) in my front garden. My plan was that the Goldeneye would be shorter than the Turk’s Cap. But the drought has caused all of my Turk’s Cap to be about 1/3 shorter than usual. I still like the combination though. Finches (of all sorts), as well as other birds, also love the seeds and it’s recommended that gardeners let the spent flower stalks stand during the winter for the remaining seeds. That Goldeneye has “spent” flower stalks means that it isn’t evergreen–it is a herbaceous perennial. Goldeneye is drought tolerant and easily transplant-able, but according to the NPIN website, not terribly deer resistant. 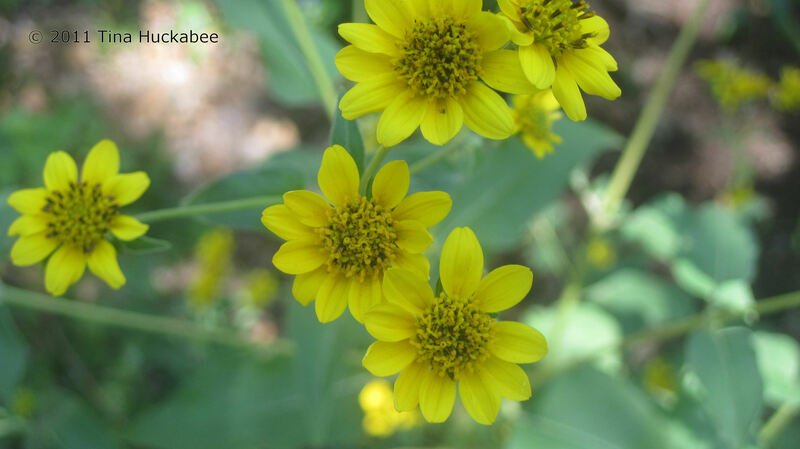 Goldeneye brightens the fall blooming season with its brilliant yellow flowers, is a great wildlife food source and is an easy, tough plant that every Texas gardener should have! 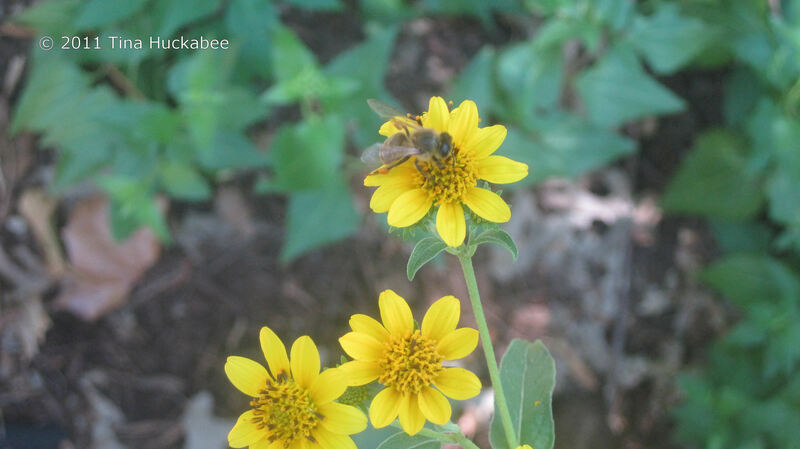 This entry was posted in Goldeneye, Native Plants, Wildlife food by Tina. Bookmark the permalink. I love that plant too but this year it is missing from my garden because of the heat and drought. I watered one plant by the front gate and it was starting to bloom with the tiniest of flowers. Alas, the deer came by for a much. Bummer! I’m fortunate that I don’t have deer to contend with. So sorry that your Goldeneye was munched–perhaps we’ll have a gentler growing season next year and some more will germinate for you. I like that your chairs echo the sunny color of the goldeneye. Purely accidental, I assure you! But, I bought those chairs in yellow because they are so cheery and they do work well with the lovely goldeneye. This may be the plant in the greenbelt behind our house. I’ve always wondered what it is. 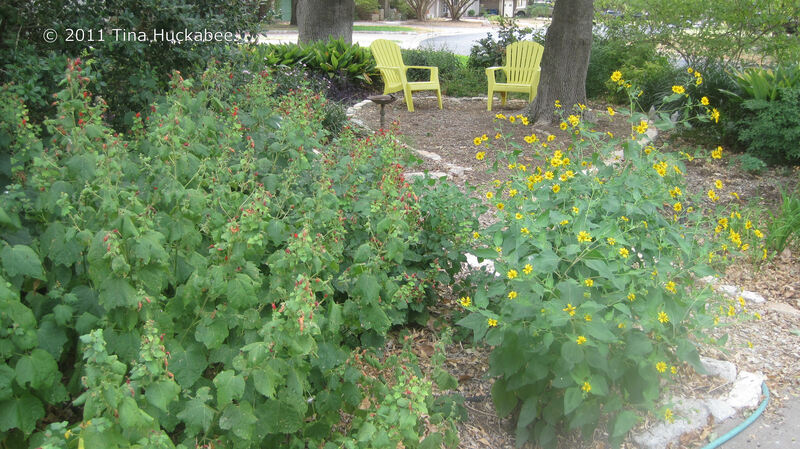 Does the area with the turks cap get much sun? I’d like to add this to one of my part-shade beds. Do you think that is enough sun? The plants in the greenbelt get full sun all day. I have 9 (wow, I never counted them) stands of Turk’s Cap. Some are in almost complete shade, some in full, blasting sun–the others in between. They do well in part-shade. That’s part of what makes this plant so great–its versatility. Best of luck –I’m sure you’ll be happy with them. I would recommend pairing them with something that has winter interest though–just a thought. I’m sorry Tina. I wasn’t very clear at all in my question. What I meant is: I think that goldeneye is the plant in the greenbelt and I would like to add it to the stand of turk’s cap I have under a canopy of live oaks. I was wondering if you have goldeneye in shade/dappled light? Sorry for the confusion. After rereading my question, I see where you thought I was talking about the turk’s cap. Oh so sorry! I did misunderstand. Yes, the Goldeneye will work in a dappled/light shade situation. If you look again at the photos of the Goldeneye at Zilker Botanical, those are in dappled shade. What I’ve observed is that they grow a bit taller and lanky with more shade. Staking will probably be necessary. They bloom though and if they’re placed in the back of a garden, will be quite striking in September/October.